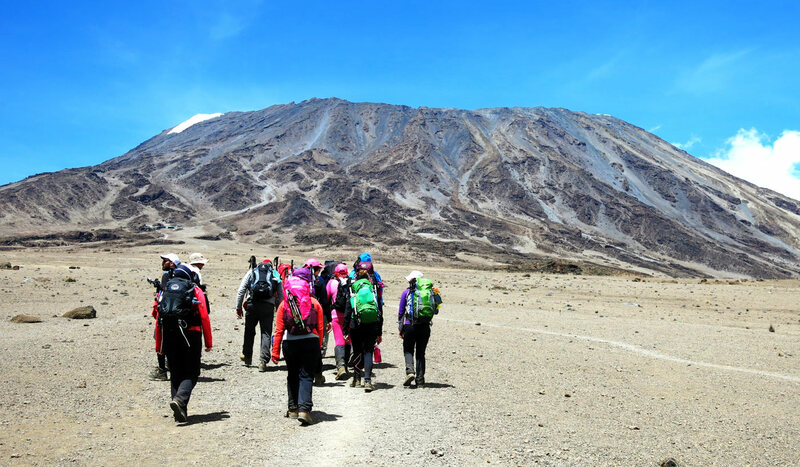 The best Months for Kilimanjaro Climbing Umbwe Route are January, February and also August and September. We stay at Mvuli hotel , which is a beautiful Hotel located on the lower slopes of Mount Meru and is a perfect place to prepare you for adventure. The climb starts from Umbwe Gate (1,800 m.) The path follows a ridge between two deep valleys up through the dense montane forest. The camp is perched between huge trees and thick undergrowth. There is no water available at this campsite, so we must carry from the gate all the water needed for drinking, food preparation and cleaning. Umbwe Cave to Barranco valley (3,950 m); 4-6 hours walking. A steep climb out of Karanga, and an easy path on compacted scree with wide views through this empty and dry landscape up to Barafu Camp. The two peaks Kibo and Mawenzi can been seen from Barafu Camp. After a hot lunch at the Camp, The remainder of the day is spent resting as we prepare for the final ascent before an early night summit walk. A gentle walk takes us down through the rainforest to Mweka gate successful climbers will receive their summit certificates. After lunch we drive back to Mvuli hotel .